Cottage potatoes are raw potatoes that are cooked in a frying pan. 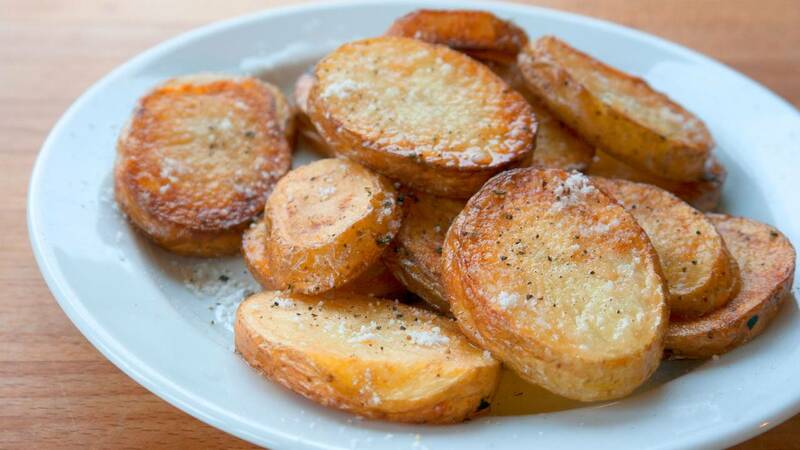 It's a good way to fry 2-4 servings of potatoes. However, it is not a good way to cook large quantities of potatoes. If they lie in layers on the pan, then the upper potatoes are cooked, and the bottom ones are in high risk of burning. There may be raw potatoes, hidden among the other ones and that can really make pan fried potatoes into a sad affair. Otherwise, you must use a really long frying time on large portions to be sure that all the potatoes are tender. At the risk of some getting burned. So here are my tips for making them. Wash the potatoes and cut them into 1 cm (½ inch) thick slices. Heat fat in a medium hot to hot pan. Fry the potatoes in one layer on the pan for about 10 minutes. Sprinkle with salt. Turn them over and fry them for about 5 minutes. Turn them over one final time and fry them about 2 more minutes. Pour them like on a plate with fat absorbent paper. For each potato start by cutting of a thin slice of the end. It is not easy to roast a round potato tip. Removing the tip makes all the slices uniform in shape. It is not important that the slices are exactly 1 inch thick, but it is relatively important that they are the same thickness so that they are done at the same time. I put only one layer of potatoes in the pan at a time so they all become equally browned and cooked through. Now, in the directions above I set quite accurate minutes for each side of the potato slices. This is of course nonsense, because it depends on the power of your cooktop and the quality of the pan. But the principle of frying them first on one side about half the cooking time, then half of that on the other side, and then just half of that again on the first side one last time, is a good principle. So if it's a dish you want to make often, it pays of to experiment with the settings on your cook top, so you get the same result every time. My cook top is an induction one, and it can range from 1 to 9. When I put it on 6, it is exactly fitting for 1 cm (½ inch) potato slices to both brown on both sides and be tender after 10 + 5 + 2 minutes. Yes it's geeky, but it's handy to know that they can be done in 17 minutes. 20 miutter including slicing. The fastest way to make potatoes I know of. So I also know that if they burns before 10 minutes then the pan is too hot. If they are not tender in less than 20 minutes, the pan is too cold. You can certainly prepare a much larger portion, but then you must turn them often so they are fried as evenly as possible, and you still risk that some pieces are semi-raw. You can hasten the process by pouring a dl (½ cup) of water in the beginning, and then steam them, covered, until they are about almost completely tender.